One of the reasons many of us end up supervising our kids so much today is that when we DO watch our kids’ every messy interaction, we see so much more than our own parents ever saw, and are shocked and dismayed. So we stay closer to monitor more, which means we see MORE frustrating-but-normal interactions and are even MORE dismayed. It becomes a vicious circle — we can’t leave them alone because when we’re with them we think, “Boy, if we weren’t here, they could never handle this stuff by themselves!” We forget that when we were young, we too made plenty of dumb decisions and wasted a lot of time (that wasn’t really wasted) and muddled through to the point where we are competent folks today. That’s what I was thinking when I read this essay, submitted to us by�Kim Kinzie, co-author of the new book “Conscious�Unparenting:�Our 1970s Spin on Modern-Day Motherhood.”�As children of the ’70s, she and her co-author Dawn Michael write about their biggest parenting struggles and seek to create “a new mode of raising children, one that�s less kid-centric and more parent-friendly; like a �70s mom with a 21st century twist.” �They call it — and their website — Conscious Unparenting. When my son turned 8 I felt it was time for him to be more independent, to walk to the bus stop and ride his bike around the neighborhood, alone. He�d proven himself to be fairly responsible, and our neighborhood, with its wide, lightly trafficked streets is quite safe. I mentioned my plans to neighbors with similarly aged children. While they didn�t criticize or judge me, they made it clear their kids would not be doing the same. That first day my son walked to the bus stop himself, he was ebullient � running out the door with a skip in his step.� I received texts from my neighbors to inform me he�d made it safely�a whole six houses away. �Phew! After school we all (kids and parents) headed to the nearby cul-de-sac.� I didn�t feel comfortable leaving my son, not because I didn�t trust him, but I didn�t want the other parents to feel obligated to watch my child, even if I didn�t feel he needed watching. So I stayed and naturally I saw behavior that was less-than perfect.� Older kids excluded younger ones, kids played tag and got too rough, someone said the word, �stupid� � all of which got called out by a grown-up. �I began second-guessing my decision to trust my son on his own. �We�ve sort of been working on the rules of kindness and respect for almost 8 years, but what if, in my absence, he forgot everything I taught him? This made me think:� Maybe my neighbors were hovering, not because they were worried about random abductions or crazy drivers, but rather the kids� behavior. �If their child was acting like a jerk or being mistreated, they felt the need to intervene.� This seemed reasonable enough. Then I thought back to my own childhood.� As a kid of the �70s, my mom was NEVER around when I played.� My best friend Karen and I scoured the �hood for other kids, and we all had our turn at being the bully, the brat, the excluded one. �Dealing with neighborhood skirmishes was a normal part of childhood, where we learned the lessons of fair play and the consequences of acting like a turd to our friends.� I did it, as did all those who went before me. My son, however, is being molded by the opinions of the adults around him. ��This seems unfortunate, as he needs to learn those lessons for himself, as opposed to being told what to do by a grown-up, yet again. As spring approaches, I�m renewing my mission to get my son out on his own.� �He might be out there by himself, tumbleweeds following him along the empty streets, despite the fact that my neighborhood is filled with kids in his age range.� My neighbors might feel the need to watch and/or reprimand my child.� It�s out of my hands, because I won�t be there, as I�ll never give up my quest to give my kid a �70s childhood. – K.K. New humor parenting book:� Conscious Unparenting.� Take parenting back to the �70s. This made me think: Maybe my neighbors were hovering, not because they were worried about random abductions or crazy drivers, but rather the kids’ behavior. If their child was acting like a jerk or being mistreated, they felt the need to intervene. This seemed reasonable enough. Then I thought back to my own childhood. As a kid of the ‘70s, my mom was NEVER around when I played. My best friend Karen and I scoured the ‘hood for other kids, and we all had our turn at being the bully, the brat, the excluded one. Dealing with neighborhood skirmishes was a normal part of childhood, where we learned the lessons of fair play and the consequences of acting like a turd to our friends. I did it, as did all those who went before me. My son, however, is being molded by the opinions of the adults around him. This seems unfortunate, as he needs to learn those lessons for himself, as opposed to being told what to do by a grown-up, yet again. As spring approaches, I’m renewing my mission to get my son out on his own. He might be out there by himself, tumbleweeds following him along the empty streets, despite the fact that my neighborhood is filled with kids in his age range. My neighbors might feel the need to watch and/or reprimand my child. It’s out of my hands, because I won’t be there, as I’ll never give up my quest to give my kid a ‘70s childhood. Unparenting:™ Our 1970s Spin on Modern-Day Motherhood. As children of the carefree 1970s, she and her co-author Dawn Michael write about their biggest parenting struggles. In the end, they seek to create a new mode of raising children: one that’s less kid-centric and more parent-friendly; like a ‘70s mom with a 21st century twist. They’re calling this mindset Conscious Unparenting.™ Join them at www.consciousunparenting.com. Why Are Kids So “Bad” at Playing Tag? So incredibly true. I always feel like I’m being watched and if my kids mess up something minor, I should do something about it. I don’t know if I’m really being watched or not. . . but I’ve been in enough situations with the moms coaching their kids’ behavior, it often feels like that’s what is expected. When my kids first started having a certain group of friends over (three brothers), it was excruciating to me to listen to all the little squabbles. We have a small house and they’re pretty loud as a bunch so it’s hard not to hear everything. At the end of the visits, the kids were always upset to say goodbye and begging to get together again. What seemed to me a big deal was not bad at all to them–it was just part of time with friends. Great article. Anyway, I can think of a smaller-scale example of this phenomenon. During a certain episode of Bubble Wrap Kids/World’s Worst Mom (the one with the boy who was only allowed to STAND on his skateboard on the grass, and not actually ride it properly on the pavement, and the girl who was afraid to sleep over at her grandparents’ house), the kids’ first assignment was to prove to their mother that they could handle their morning routine independently. The kids got up, got dressed, and even got the baby up, and all went well until they started making breakfast, and the boy poured orange juice on his cereal. Most parents would have intervened (and, left to her own devices, Bubble-Wrap Mom would have done so), but Lenore didn’t say anything, and figured that the boy could live with funny-tasting cereal for one day (and, it wasn’t a blatantly clashing flavour combination either; I think the cereal was Cap’n Crunch* or something). Anyway, Lenore had it right. Despite that minor hiccup, both kids were proud that they’d made it through their morning routine with no hovering. Intervening and saying, “No, milk goes on cereal; orange juice is to drink,” would have defeated the whole purpose of teaching independence, and you know what? 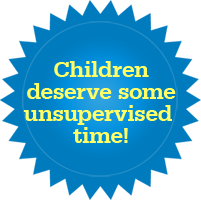 Hovering over kids’ playtime prevents them from developing independence as well. There’s nothing wrong with being in the vicinity. You could have adults inside the house while the kids play outside (either during a play date, or free-form playing in the neighbourhood), or teachers scattered around the schoolyard while groups of kids independently choose their own recess activities, or camp counsellors turning the kids loose in a wooded area for a game of man-hunt or a nature scavenger hunt, or a gaggle of preschool moms sitting on park benches, reading books or playing with their screened devices while their kids play on the playground, but when the adults are right on top of the kids, they don’t invent their own play ideas, or solve their own problems. It’s one thing for kids to know that they can go and find an adult when there is a problem (like Lenore helps kids who are testing their Free-Range wings, IF THEY ASK HER TO), but it’s another thing when the adults are right in the middle of the action, preventing any problems from ever happening. Even when you’re physically there, it’s possible not to hover. For example, yesterday, I was teaching kids’ yoga classes** at the gymnastics club. During the first class, with the younger girls, one of them arrived late, and without her mat. We thought she wasn’t coming at all, because she’d had a cold. Anyway, there were no spare mats left, so another little girl took it upon herself to offer to share her mat with the latecomer, turning it sideways. Latecomer declined. Other girl said she’d let Latecomer use her mat all to herself. Latecomer still declined. This turned into a massive little girl drama over a yoga mat, but I just ignored it. Maybe this wasn’t the best course of action, but there were other kids there still doing yoga, and I didn’t want to stop the class to break up a petty squabble when I could see that it wasn’t really hurting anyone. In the end, the girls stopped fighting, finished the class, went back to their gymnastics training, and they were friends again by snack time. *About the Cap’n Crunch, I’ll never understand why some parents think it’s dangerous for their kids to play outside alone, walk anywhere alone, or pretty much have any autonomy at all, but on the other hand, feeding them sugary junk on a regular basis is perfectly fine. I’m not suggesting jumping on the healthy-organic-everything sanctimommy bandwagon, but the combination of a steady diet of processed junk food, and forbidding independent play, is a recipe for childhood obesity if I ever saw one. …we all had our turn at being the bully, the brat, the excluded one. I’m not worried about the kids or about other parents. I’m worried about the cops and CPS poking their noses where they don’t belong. I try to combine being there for my child and fulfilling her needs with giving her as much freedom as is possible for a soon to be 3 year old. I don’t hover over her when she is playing nor do I expect that she will break every single thing that she plays with that is not a designated toy. When she turned two I started demanding she walked up and down the stairs herself (we live in a house with no elevator and two flights of stairs to get to the apartment) and our neighbors were amazed, their 3 year old hadn’t even been allowed to try walking the stairs yet and they are only up one flight of stairs. My daughter had been allowed to crawl up the stairs since she was about ten months and allowed to walk down the stairs since perhaps 18 months (then under heavy supervision due to instability) and while I never demanded she would do so before she turned 2 she did so volontarily most days before that point.They did start letting her walk up and down the stairs though when they saw that my daughter who was that much younger could do so. I do of course think sometimes “What would they say if she fell and they heard that I wasn’t hovering over her” but since she hasn’t fallen over yet I can’t walk around expecting her to fall down the stairs when she can walk up and down the stairs. I often feel obliged to hover at times when I know that I don’t need to hover (my kids are 5yo and 3yo – practically grown up). But I hover because the other parents almost demand it. Not often, I oppose that ind of peer pressure as much as possible, but some times with people I don’t know I feel the daggers. I was at school pick-up the other day. Waiting inside the school gates for my 5yo. Meanwhile my 3yo was some distance from me balancing on a little brick wall. Another child of similar age went and balanced too. A dispute broke out (ie my daughter was crying), I ignored it happily, because I knew exactly why my daughter was crying. She was annoyed that the other child was in her way, I expect her to make some attempt at resolving the problem, or to come and get me for help, I don’t encourage crying until I arrive to help. I wish other parents could assess a situation equally. The other parent went in to help, apologising to my daughter on behalf of her child (seriously, no apology need). Peer pressure got the better of me, I had to go hover. By the time I go there the offending child had been removed and my daughter had full control of her wall. To be truthful I was unimpressed. Emily- taking the comments slightly aside from your second asterisk here. People are sometimes amazed by what my children eat and by what interests them. The food part is because we simply expect them from the time they’re big enough TO eat it, to eat what we serve. That’s a wide variety. So they like a lot of things, and what they end up disliking is unpredictable as well. 8-year-old daughter didn’t like the gnocchi in soup on Friday- but we aren’t too fussed over it. The “kid foods” that show up here are usually a little more from-scratch too. Their interests are a product of several factors- part of it being that because we homeschool, we’re outside of the bombardment of pop culture that a lot of kids get. We interact with pop culture on our terms- and still haven’t seen Frozen! Anyway, my 5 year old son likes old cars, they all like to watch the birds, and my 8 year old can recognize Judy Garland and Mickey Rooney by name! I think homeschool families probably lead the pack for this type of hovering, and as a result I’ve seen the backfiring of all this social guidance. When my boys were elem. age, we were in a small (15 families) homeschool co-op. There was one boy who was hyper-competitive, to the point that everyone else could not stand him, including the kids who were much older. He, being a single person, could always manage to perform his aggression when the teacher was not looking, and the other kids were all “too nice” to handle it the way he needed to be handled. When at home, we parents would all discuss with our kids ways to attempt to deal with this kid w/o causing more trouble, but what this kid really needed was a major smack-down. Everyone one was too “nice” and too uber-concious of what the other parents might think, to allow it to happen. We all really liked the mother, and while she was aware of the issue, she also felt helpless to fix it. No amount of parental guidance and “consequences” could solve this problem. The kid really needed the whole pack to let him know it would NOT be tolerated, and to retaliate en masse. He did eventually grow into a good teen, and is able to channel his competitiveness into sports, but my kids still want nothing to do with him. Whenever someone starts to worry about other people’s opinions of how we do things, just play this song. Better yet show them the video. I have a question for people who have/spend time around kids about the food issue. It seems like so many of the kids I come across (and I don’t see that many kids, which is why I am asking), refuse to eat almost everything. Is this a new thing? I don’t remember it being like that when I was a kid, but I don’t really trust my memory on these things either. I’m sure parents catered to our tastes by making relatively kid friendly food, but I really don’t remember being completely unwilling to even try things as many kids today seem to be. So many parents seem to make a meal just for the kid(s) and eat something else themselves. I know I’ve brought this up before, but “WHERE DID YOU GO?” “OUT” “WHAT DID YOU DO?” “NOTHING” should be required reading for free range parents. Published in the late 1950’s, it is the author’s reminiscences of what kids do when they go “out” and do “nothing”; building forts, roasting potatoes, smoking cornsilk, shooting immies, collecting horse chestnuts, tying each-other up, and so on and on. And he makes it clear that an adult would not have been welcome, no matter how much he tried to be a “pal”. He would be a spy. Also he wouldn’t KNOW anything. The book was a huge hit when first published. In something he wrote later he tells of a meeting with some publishers who wanted his to write another one, but about little girls. Anyway, it isn’t hard to find, and it IS absolutely priceless. The thing that annoys me the most is the parents who insist that my child shouldn’t do something because younger children can’t do it. Last year my kid and her friends liked to sit on the top of the monkey bars on the playground and eat their snacks after school. It caused an minor uproar with some of the parents who insisted that because the littler kids wanted to climb up there but couldn’t, the bigger kids should get down. And it wasn’t limited to the parents of the younger kids. A couple of the parents of the older kids insisted that their kids had to get down because it wasn’t fair to the little kids. Since when did we decide that children should be limited in their activities by the abilities of the smallest kids on the playground? This wasn’t some cohesive group where the older children were leaving their younger friends behind. It was a collection of various groups of kids who hang out after school to play with their friends. My kid didn’t even know the kids who wanted to get up there but couldn’t. Tiny Tim – Kids and eating have always been an issue, My mother complained about my pickiness. I complain about my daughter’s pickiness. My daughter will probably complain about her kid’s pickiness. That said, I do think parents today cater to it more. My mother was willing to slightly alter things for me – ie give me noodles with butter and cheese instead of clam sauce – but not cook entire different meals. I know several parents who do cook separate meals for their kids. Well, I did, and continued with as many as 60 girls of early teen years for almost 10 years in addition to an administrative capacity for the Boy Scouts. “My girls with guidance but mostly under their own leadership, did pretty much anything…week-long backpacking trips, river canoeing, week-long bike trips, camping (and catching for dinner rattlesnakes) at a nearby Boy Scout camp. My Boy Scout colleagues would ask, first, if girls could really do the things my troop did, and second, if girls were “different”. I told them that the only real difference I could detect about their interests and actions was that they had longer hair, and giggled a lot. It also builds emotional resiliency and ability to handle minor issues independently, something many children of this extremely supervised generation cannot do without an adult. Kids handle their disputes so much better without adult intervention. The kids who don’t and constantly tattle on others drive me b@tshit crazy. They’re exhausting. I don’t tell my kids who to play with but encourage them to find friends who are easy to get along with. Most of the kids around here play really well together (ages 4-16) and rarely require anything more than *indirect* supervision. My daughter came to me this weekend when an older boy borrowed some of our sports equipment and refused to give it back when it was her turn to play. I sent her back out armed with what SHE would say to him to get it back and she did. She needs to be strong and handle these confrontations, not be a pushover who runs and gets an adult to intervene. I’ll give her advice, but I won’t do it for her. @Donna–That’s a really good point. I mean, first of all, sometimes the older kids teach the younger kids new things on the playground–cartwheels, climbing higher, jumping from swings, making it all the way across the monkey bars, etc. Sometimes they don’t, and the younger kids have to figure it out on their own, but it’s a rite of passage, and it keeps the playground from becoming boring, seeing what’s possible once they’re taller, stronger, et cetera. Second of all, the same rule doesn’t seem to apply to adults. I mean, I bet nobody’s ever told you to stop being a lawyer just because some people aren’t smart enough for law school, or can’t finish it once they get there. I think this article was written for me…I struggled with this in my neighborhood for many years when my kids were younger. There was a Mom who believed we should all “know” when our kids did something wrong and wanted to see other Moms punish their kids for whatever she perceived to be “bad behavior.” It was quite a conflict, since I believed in staying out of things and not responding to tattling. We finally had a sit down and discussed things, and basically agreed to disagree. Since the kids usually played in my yard, I just ended up saying, “Your son is certainly welcome to leave the yard when he doesn’t like what is going on.” But to her, that was being “noninclusive” or the other kids “bullying.” To me, it was normal kid stuff, usually someone getting left out and within two hours all is forgotten. Very difficult when another parent is just NOT on the same page at all. Everything kind of blew over as the boys got older. But she did understand after our conversation that I was NOT going to change my parenting style to create a “perfect” world for her son. Well thought out piece. I agree. I have found lately the more responsiblity I give my kids even my son with autism that is delayed, the better they do and the more they surprise me. I guess you do have to push them to be more independent and give them that space to do so. My twins are 8 and I am about to let them start walking the very short distance home from school alone. I worry a lot about my son with autism for good reason, BUT he has shown with me that he can do it, so I am going to let him try it alone. I have to challenge him. I also have started making them do more chores around the house, nothing big just like making their beds and vaccuming up crumbs and they have done really well with it. I was surprised. So sometimes we need to push ourselves and our kids to do more and that means letting go more as well. If they prove unable to handle it, you can always go back and readjust but you never know if they can do it till you let them try. Navigating the unwritten rules of kids playing with other kids was one of the most difficult things for me after the birth of my first child. 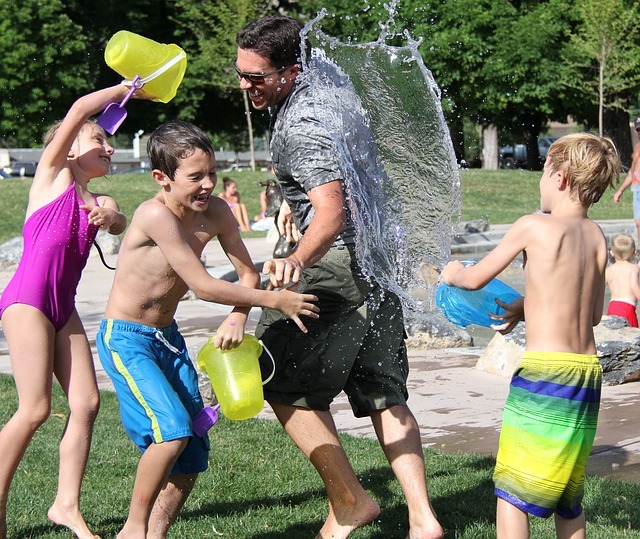 I thought I was supposed to let the kids loose to play, but I got the very definite feeling that there were rules I hadn�t been told about the acceptable way to let your kids interact with others and it required constant supervision from me. I was just talking to a friend this week and asked her what she did when she takes kids to the park � I am always so bored. Her children (ages 5 and 3) require that she plays with them at the playground. I wouldn�t stand for it, and I don�t think my kids would either. They prefer to play when I�m not watching � it�s more fun that way. I prefer to go to the park after dinner. There are more dads watching their kids (who seem to care less) and the mothers present at that time seem to be more relaxed too. Where are you in Portland? I live in Sherwood and it is helicopter heaven. I know kids who are eight and bussed three blocks from home. We’re thinking of moving in a few years and although the community itself is great, I could really use a different mindset among my neighbors. It’s a matter of normalizing things, I guess. Lots of parents today think constant supervision is ideal because that’s what is acceptable in many places. And when you yourself do something for a long time, you might grow to think you need it. @Elsie–I know what you mean about kids expecting their parents to play with them at the playground. A few summers ago, I got a short-term job as a face paint/balloon artist for kids’ birthday parties, waterfront festivals, and whatnot. This required me to meet in person with my boss for training sessions, and since she had kids, we’d often meet at the park near my house, supposedly so her kids could play on the playground while she taught me how to make the more complicated balloon animals (I’d taught myself a few simple ones from YouTube). Anyway, the plan was for her kids to amuse themselves on the playground equipment, but that would usually last about five minutes or less, before they’d want her to join them. One of the kids was under five, but the other was nine or ten years old, and fairly mature–he could make balloon animals, and do face painting, nearly as well as his mother, so he clearly had the willpower to sit and learn a skill, but he just wasn’t very good at playing alone, or with his brother, if no electronics were involved. The one time we met at the public library instead, the kids made a beeline for the children’s computer area, plugged themselves into quasi-educational games, each on a separate computer with a separate pair of headphones, and we didn’t hear a peep from either of them the whole time. P.S., Donna, I can actually think of a context in which I’ve been subjected to a variation on the “don’t do XYZ, because the younger kids can’t do it” theme, as an adult, and that context is yoga class. For the uninitiated, in most classes, the poses that the instructor gives are just suggestions, and you can modify the poses as needed, to make them easier, or more challenging. So, the instructor will either show multiple options (like I do), or show the intermediate option, and people will modify up or down as needed. That’s all fine, except I’ve participated in some classes where the instructors have gotten upset with me for modifying up, because it’s “showing off,” or “other people will feel badly that they can’t do that,” or “someone tried to copy you and almost fell.” Now, if I’m teaching a class of regulars, and I know what they’re capable of, then I’ll plan the routine accordingly. If I’m teaching a class of people I don’t know well, then I’ll play it safe, and make adjustments in future classes. However, if I’m attending a yoga class as a participant, I’m there for myself, and I shouldn’t have to take responsibility for the physical and emotional well-being of the other ADULTS in the class. In her book “Perfect Madness” author Judith Warner called attention to the constant “I” in mothers’ narratives about why they hover: “I feel bad,.. I’m afraid…” etc. Kids don’t need constant reassurance, the parents do. Some homeschool groups may not let kids work things out for themselves, however that’s obviously not all of us. Many of us are of the “We’re over here having adult time, go away” method of group play and let the kids work it out for themselves except to occasionally wander to a different angle to make sure we can locate all the children. I’m sorry, I wasn’t very clear in my previous post. The situation above was primarily in our co-op PE class, where there was only 1 or 2 adults present, which gave the competitive kid only 2 pair of eyes to avoid, while the rest of the kids could not respond en masse w/o getting “caught”. They generally didn’t tattle because that’s breaking the Kid Code, and he WAS part of the group regardless of his attitude. The competitive nature of the group games brought out the worst in this kid. We did often get together outside of co-op and then let the kids run free and out of sight, when they were old enough and when our MN winters let them go outside. There were still certain parents, certainly not all, who felt that every dispute had to be parentally resolved in order to “teach” them “conflict resolution skills”. Let-them-fight-it-out was not an acceptable option for certain moms, and the rest of us attempted to work with that when necessary. My youngest just came through the room and looked at the topic over my shoulder. He said there was more than one occasion when an older/largest kid in the group got in the brat’s face and “encouraged” him to behave. It only worked when that one kid was present, though. I think one way to partition the homeschooling world is those that homeschool to give their kids more freedom and independence than a school allows, and those who homeschool to protect their kids from the evil influences of the Lord of the Flies circumstance that they just know prevails whenever kids are allowed to run in packs- particularly on school buses and in poorly supervised lunchrooms and playgrounds. The former thinks kids should learn to work things our among themselves. The latter thinks all behavior must be explicitly taught by proper role models. Our co-op had both kinds, and because the co-op was so small, the kids and moms both had to learn to get along regardless. I spent time in both camps over the years. With my daughter/oldest child, I was much closer to the “avoid evil influences” side. With my boys/younger kids, I was more than happy to get them OUT of my hearing/house/mommy-time so I could regain some sanity! Speaking of leaving your 8-year-old son on his own, this past Saturday just before I got my eyes checked at Pearl Vision, a boy who looked to be about 7, was scheduled to have his eyes checked. So the parents told him, “Go ahead Jason, mom and dad will wait”. So the little guy eagerly ran into the examining room and popped up in the chair while his parents remained in the waiting room. I thought that was pretty neat as his parents were obviously free range. BUT, wouldn’t you know, the Optometrist informed the parents that he requires one parent to be in the examining room with the child. At first I thought, what a fuddy duddy! But then again, I think the Optometrist was only requiring that for HIS protection which makes sense. The last thing he’d want is to have Jason tell his mother that Dr. —– “touched my pee pee while I sat in the chair” when he really didn’t touch his “pee pee”!! I remember when I was 14 back in 1970, I rode my bike down to the doctor’s office and went to the doctor without either of my parents present for my 9th grade football physical. I mean, I was a big boy by that time! But I lived in a small town where you could ride your bike anywhere in town and since the doctor’s office had a record of our insurance, I’m guessing they just sent the bill to my parents for the co-pay. But I can’t imagine today in our paranoid country a Physician allowing a < 18 kid in the examining room without a parent present. Does anybody here have a < 18-year-old child who was examined by a doctor, dentist, optometrist, etc. without you present? I'm just curious. Personally, at 16 or 17 I would have been embarrassed to have my mother or father present with me in the examining room while the doctor was giving me a physical! Donna and Emily and others, I was interested in what you said about “no kid can do this since not all kids can handle it”. I don’t know what others would have done. I was torn between being sad and proud. Julie 5050 has it stopped? How long ago was the “sit down”? If it is over, and it sounds like it is, be unreservedly proud. You aren’t always going to be there to fix her problems and she knows it. She is practicing while she still knows she has you for back up if her plans fail. I was the kid who ran to mom for help for a long time. I eventually figured out that the problems I fixed for myself stayed fixed. The problems I ran for help on had a tendency to come right back and even spread. I’m always trying to get my 2-1/2 year old to go play without me but he’s very clingy right now, getting adjusted to baby sister. I’m looking forward to when I can tell them to sort it out for themselves. I’m tempted to now, but she’s small for her age and he is huge for his. I’ve long since noticed that the more I watch the more upset I get about things that aren’t worth being upset about. There is something really horrible in the anticipation of disaster. I had to quit watching her when she was learning to walk because I wasn’t preventing her accidents and I was turning into a nervous wreck. Also I found that I could handle the aftermath more easily than the sensation that the accident could or should be prevented in the first place. By the time the accident happened I wasn’t relaxed enough myself to deal with it. Most recently the thing that drives me nuts is spills. I see my daughter put her cup to close to the edge of the table or reaching for things without paying attention to the presence of the cup. And I would get nervous and nit picky. The spills would happen anyhow, and then I would be really irritated because I saw that coming. And I would clean it up because she didn’t react fast enough for my taste… not cool I decidedly have a helicopter reflex. A little while back we gave her the option to clear her art table and eat in the neighboring room whenever she wanted. I found I wasn’t upset when she called for help even though I knew 9/10 it was because she spilled. And I really wasn’t bothered at all when I found out about the spill because she walked past me taking a soaked towel to the laundry, or because we saw her fetching a clean towel from the stack. In fact I found myself quit proud of her. She has mostly returned to eating with us, and she is much less prone to spills too. It is counter-intuitive, at least to me, but often the best solution to annoying behavior is to give her the space to make her mistakes in reasonable safety and be ready to support her fixing it in the aftermath. John, I can’t even manage to get my child’s hair cut without being right there so I can’t imagine being able to send her to the doctor. Every time I take my child to get her hair cut, the hairdresser makes me come back and looks to me to okay every snip. No matter how many times I tell the hairdresser “it is her hair so whatever she wants is fine,” I still have to be part of every decision. It infuriates me. On the kids alone in medical offices issue. When I was first signed up with our pediatrician’s office they gave us a form spelling out that state law gave the child the right to seek assistance from the pediatrician (usually for the pill, STDs test, etc) without the parent’s knowledge or presence. They also said that the child had a right in this state to confidentiality, even from the parents. Considering that right, it seems that at least by puberty the doctors in this state have to allow a child to come alone (at least as long as they discuss reproductive health issues). My daughter’s pediatric dentist makes parents sign a form agreeing not to speak to the child while the dentist or hygienist is present (so the child stays focused on the directions from the medical staff). They tell parents to offer support only through touch. And say that if mom/dad can’t follow those rules they will be sent to wait in the lobby. Much to my surprise, they seated me at the foot of the chair so I couldn’t actually reach her. The message was basically ‘mom, stay out of this.’ It went great, my daughter was happy, and as we were driving away she told me she liked the dentist. I asked her if it was because of the stickers and toy. She said it was because they help her teeth. Weeks later she still reminds me that the dentist said she has to drink water with her juice. I’m 25. For the first thirteen years of my life, I probably would have classified my parents as “overprotective” — I wasn’t allowed to ride my bike to school, I was the first kid to have to get a cell phone (simply because my mom was paranoid — it didn’t even have Snake! ), wasn’t allowed to cook without oversight (my mom was afraid of letting me use knives), and I was shuttled from one activity to the other (though admittedly, I did some really really fun stuff!). ~15 years ago, and in a middle- to upper middle-class neighborhood, this was *way* more supervision than just about anyone else. It was annoying, and I was probably a little coddled. Then I ended up in boarding school when I was 14. Virtually overnight, I was living on my own, managing my own bank statements, cooking my own food (okay, mostly ramen noodles), managing a rigorous course load, and generally running my own life. This helped my parents realize that I was a (likely hormonal and testy) young adult, capable of doing most things on my own. My relationship with them (despite the occasional speed bump) became one built on mutual respect and tolerance. I stumbled on this blog and I’m disturbed by the accounts of hyper-parenting typically young children that I’ve found here, and I’ve found myself agreeing with most of the comments. However, I think it’s crucial that this “free range parenting” mentality carry through when dealing with teenagers. Teenagers will be teenagers (and rude, and selfish, and annoying), but most can really manage and do think of themselves like adults. “Allowing kids to make mistakes” carries over into allowing them to make mistakes with alcohol or pot and enter an unwise relationship, so long as they’re taught to do these things in safe, smart ways. Perhaps I’m preaching to the choir here, but you’d be surprised how many friends I had that were allowed to roam free over the neighborhood at 7 years old but were absolutely “barred” — because obviously they did it anyway — from having a boyfriend or prevented from so much as taking a sip of beer in a safe location. Ten years later, my parents are some of my best friends, and a lot of it’s because we started building that truly adult relationship when I was 14. In a word, YES. I believe that this constant vigilance state that we’re in becomes a habit and we reinforce to ourselves that everything is dangerous or messy or both. Gasp! I find myself doing this when I am just casually watching the kids play. Not necessarily supervising, but I’ll catch them roughhousing or being a little crazy and start to say something. I try to catch myself because they’re just doing the things kids do when parents aren’t looking. Nobody is getting hurt and nothing (important) is getting destroyed. Love this post and I’ll be checking out their book and blog. Thanks! AFAIK we still have school doctors here, who come by once a year to see all children of a certain age and then check height, weight, eyesight (euh.. Don’t remember more than that. Nothing which involved getting undressed), so that would be without parents present. I can’t imagine dentists or optometrists etc etc demanding that a parent stays in the room. I was a picky eater too, and there were things I wouldn’t eat (much), but the only kid variant meal I remember was pita bread with scrambled egg and ham instead of pita bread with shoarma (English? ), until we discovered shoarma is delicious even with lettuce and paprika… So no “kid food” here (no “kid snacks” either). I’ve become less picky over the years, and for a number of ingredients it really depends on what kind of meal it is: for instance I don’t like paprika, but will happily eat it in little pieces in the macaroni/lasagne/mousaka/risotto rice/tortilla/pizza/bami etc as long as I like the overall taste of that meal. Julie : Brava to your daughter. She is going to do great things in the future. Some adults I know are not that capable of working the system so she is wise beyond her years. She will make a great future lawyer or social worker or medical advocate etc. I agree with you. Teenage years is the most important time to give them space and independence because you only got 4 years or so till they are adults and on their own and you as the parent have lost control. I also have seen too many parents be too psycho about monitoring and restricting their teens and it backfires big big time. Those teens were the naughtiest ones of all.